Environmental engineers often use the SR methods to determine the top of bedrock or depth of the water table, locate fractures or faults, and characterize the type of rock or degree of weathering. The SR methods are based on the fact that elastic waves travel through different earth materials at different velocities; the denser the material, the higher the wave velocity. The elastic waves are initiated by an energy source (hammer or controlled explosive charge) at the ground surface. A set of receivers, called geophones, is set up in a line radiating outward from the energy source as shown in Figure 9.14.3. Waves initiated at the surface and refracted at the critical angle by a high-velocity layer at a depth reach the more distant geophones quicker than the waves that travel directly through the low-velocity surface layer. The time between the shock and the arrival of the elastic wave at a geophone is recorded on a seismograph. 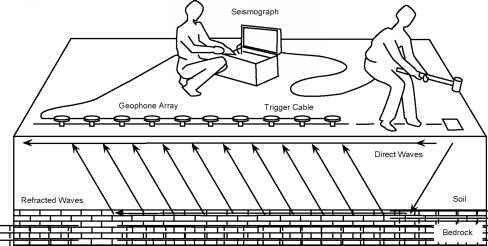 Using a set of seismograph records, engineers can derive a graph of arrival time versus distance from the shot point to the geo-phone. 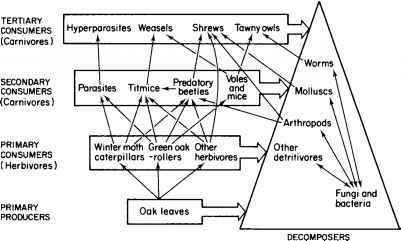 They can then analyze the line segments, slope, and break points in the graph to identify the number of layers and the depth of each layer. In addition, they can use typical seismic velocity ranges to determine the type of soil of each layer (U.S. EPA 1993a). The advantages of SR methods are that the equipment is readily available, portable, and relatively inexpensive. In addition, the methods are accurate and provide rapid areal coverage with depths of penetration up to 30 meters. The disadvantage, however, is that the resolution might be obscured by layer sequences where the velocity of the layers decreases with depth, and thin layers, called blind zones, might not be detected. Furthermore, the methods are susceptible to noise from adjacent areas (such as construction activities) and do not detect contaminants in groundwa-ter.